This is a series of Queries and Answers from and to Anthony in the USA regarding his proposed Z scale Magnorail layout and he road surface thickness and materials to use. When I search for A3 laminating pouches I see them with 3 mil and 5 mil thicknesses. Isn't this too thick? I thought if using photo paper you don't want it more than .4 mils. I tried printing out some samples of road patterns from the site in N scale size and only get something so small you can't really see what the pattern is. Maybe I need to play with my printer adjustments. I have seen some fairly thin laser cut cardstock roads that may work though I am concerned a little about their thickness. I believe they are all under 1mm thick. If you are laminating, the paper can be 80gsm or standard copy paper. The laminating process automatically enhances the photo or artwork. I am sure you can find laminating pouches which are thinner as well as photo paper which is more light weight. Some pouches are heavier gauge as they want the finished product to be more robust for menus or placemats. If you go to https://www.globalplasticsheeting.com/mil-thickness-compared-to-mm-millimeter-and-inches you will see that US mil is totally different to international metric millimetres - so it is all in the translation - so you should be looking at about 1mil if you can get it. We also classify our pouches in microns and 80 microns is the standard laminate thickness here. I would suggest going to Staples or Office Depot and see if they have any off cuts from their laminating service area and check them in a micrometer so you know exactly the thickness you need. As you are you using z or N scale? The vehicles are lighter and the magnetism factor is enhanced I would assume and road bed thickness may not be as critical as you are moving lighter vehicles. A bit of trial and error, but I have found the Matt laminating surface to be reliable and also cleanable as slider residue can build up. ​The original suggestions for using photopaper recommended spraying with a matte medium after painting or coloring it. Does the friction from the sliders wear it away over time? does it need to be refreshed? I'm not sure yet which surface option I will go with but if I wanted to use the photo paper or a thin cardstock I want to make sure it doesn't get ruined in short time. After 30 hours of continuous action at exhibitions, I generally get a soft cloth and some multi purpose cleaner and give the track a good rub down. This generally gets rid of any residue from the sliders plus all the dust and muck that accumulates from being in a dusty public place - just like trains, you need to maintain the track, so you want the roadbed to be reasonably durable which I have found my laminating option to work well. As you were talking about Z scale, I would suggest that any vehicles you have will be extremely light and you may get away with attaching magnets directly to the body of the vehicle. I have done this with the John Deere lawn mower you will see in some of my latest videos. I actually drilled out a small cavity so the magnets sit up in the body so that when placed on the track, they do not actually make contact but the magnets are strong enough to attract the the track magnets and get pulled along. With Z scale you should be able to get away with possibly even the pin head size magnets that came with your sliders and would normally be stuck on the sliders. I then stick a small piece of velour (comes in rolls with self adhesive back - craft shops or hardware stores should have it) and is used on ornament bases to stop them scratching bench tops. This has to be attached with the pile going the correct way so that it is smooth when the vehicle goes forward and reduces friction. Doing it this way means that your vehicle is running on its wheels but still being pulled along and if the bottom does touch the road surface, the velour should not mark the roadbed as easily whilst not impeding the movement. Hope this helps - try some experimenting. Remember if you use superglue and need to remove a magnet that might have flipped and reversed the polarity, you cause nail polish remover with acetone in it which frees the glue but be careful that you don’t melt your vehicle in the process if it is a light plastic. Thank you for your patience - it has been a steep learning curve for the new owners and they have tried to overcome some shortages, especially in the supply of motors which have been slow in getting manufactured. An email today says that the motors are due by early April and boxed sets will once again be able to be produced. ​The pent up demand has been huge worldwide, with their initial manufacturing order double of the purchases during 2018, yet the first order delivered will only cover backorders so a new manufacturers order is well under way. ​So you should see Starter Sets appearing on web sites in the latter part of April. ​Regrettably when stock does arrive there will be price rises on most of MagnorailOz items, mainly due to the poor standing of the Aussie dollar against the Euro and the US$. (Obviously that is good news if you are in the USA) This tied in with an increase in the wholesale prices and substantially dearer freight from France than the Netherlands which we cannot afford to absorb. ​Even so, the MAGIC of the Magnorail system is a lot cheaper than having to run a fleet of non digital Faller Cars that zip around at unrealistic speeds. You will also have noticed that you can no longer buy the individual bicycles in kit form, so you will now be receiving hand assembled and painted bicycles across the range. This does exclude the bicycle starter set, which still comes with a male and female cyclist that require assembly and painting. If you are all thumbs (and there are very small parts in the assembly) Would recommend buying the slider starter set and purchase ready to run bicycles. With a small train controller you can bring the fast speed motor down to an acceptable pedalling rate. The 2019 Warrnambool Model Railway Exhibition will be held at St .Joseph's Primary School in Botanic Road Warrnambool. Saturday 12-1-2019 from 10 till 5, Sunday 13th from 10 till 4. 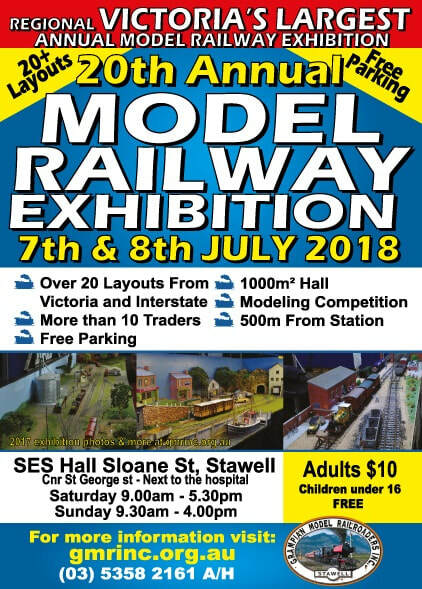 Exhibition of invited model train layouts from across Victoria. Trade displays by leading Model Manufacturers across Australia. 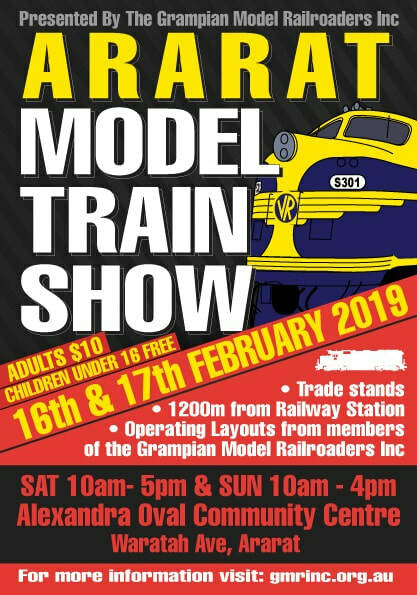 We will be at The 2019 Warrnambool Model Railway Exhibition this weekend, which will be held at St .Joseph's Primary School in Botanic Road Warrnambool. Saturday 12-1-2019 from 10 till 5, Sunday 13th from 10 till 4. What scale can I use with the Magnorail system? Jose Munoz was asking about O scale models on the Magnorail System - I replied on my YouTube Channel klatchco56 in the following way. SoRry if we are out of stock! Magnorail in the Netherlands have sold their business to Maketis in France. It was offered to their top three resellers as a going concern. We at MagnorailOz did our due diligence but had to decline in the end purely because of the logistics of having products manufactured in Europe then sent to Australia for assembly and packaging then sending back to Europe and the world to resellers - a nightmare for our one-man operation. Maketis have assured us that things will be back to normal by about February depending on manufacturing operations turn around. In the meantime MagnorailOz bought a lot of the boxed stock but that is gong fast, so check the website for current stock levels. Hopefully by the end of February we will be back in to a full stock position, however if we are out and you want to pre-order, just drop us an email at magnorailoz@gmail.com and we will advise you once the new stock is in. Onwards and upwards and the MAGIC will continue despite this hiccup. 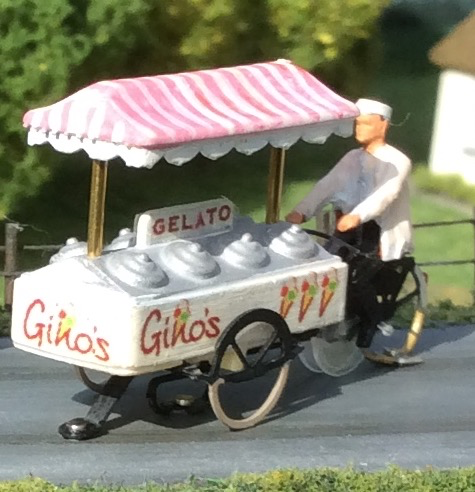 I was advised that Magnorail have issued a ready to run Ice Cream Vendor and finally have the cargo bike in stock, so I have ordered some of each but will be grabbing one of both for my display layout. Only one day before the big local train show and things are mad getting everything ready! A recent promotion in both the model railway magazines in Australia has seen unprecedented sales occur. We're reordering at present so please be patient otherwise you can email us at Magnorailoz@Gmail.com and we will put you on our wait-list. As mentioned below it still works out cheaper then buying through Europe, usually about two weeks before we can get the restocking completed. We also had a great weekend at the Ballarat model train show Queen's Birthday weekend which help deplete our stocks.